I’m not lying when I say this could be my FAVORITE dish I’ve made in the Instant Pot. (And if you don’t have an Instant Pot, you can make it really easily on the stove. Read on 🙂 .) 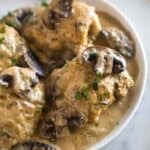 The sauce is creamy with the best flavors from the mushrooms and marsala wine and the chicken cooks perfectly in the instant pot. This is the type of meal I would happily serve to dinner guests, and it’s just a bonus that’s it’s so simple to make. 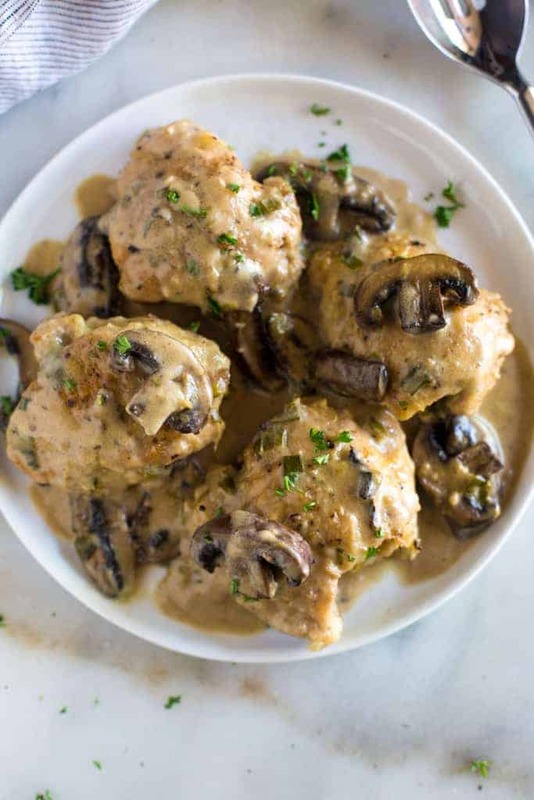 Chicken marsala is an American-Italian dish made with chicken, mushrooms, and sweet marsala wine. It makes for a fast and easy weeknight meal but it’s fancy enough for a special occasion. 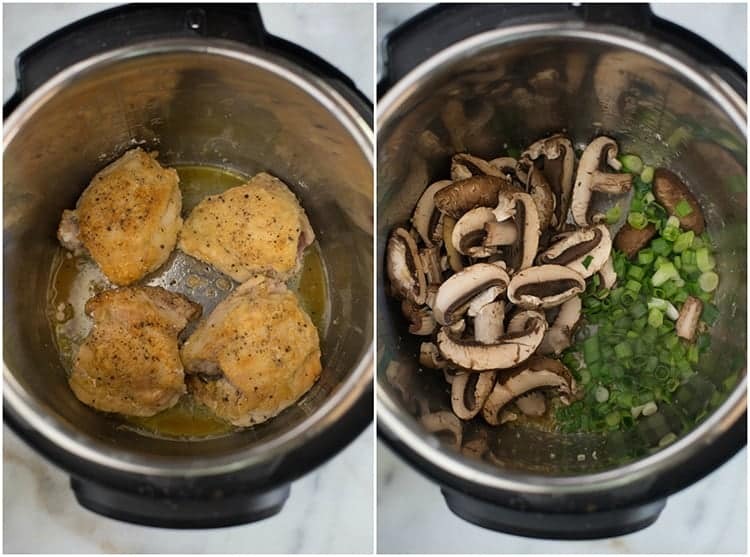 To make chicken marsala in the instant pot, start by lightly coating the chicken pieces in salt, pepper, and flour. Then put a little oil in your instant pot and turn it to SAUTE. Brown the chicken on both sides for about 3-4 minutes. Remove the chicken to a plate and saute the mushrooms, onions, and garlic. Then add the chicken broth and chicken thighs back to the instant pot. Cook on the POULTRY setting for 10 minutes with a 12 minute natural release. When the chicken is finished cooking in the instant pot, remove it to a plate and add the marsala wine to the instant pot. 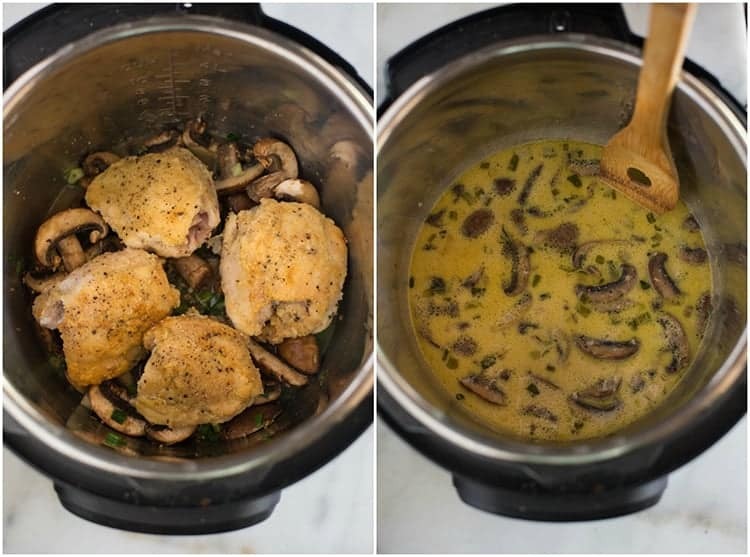 Saute for a few minutes, add the cream, and you have created your yummy chicken marsala sauce. I recommend serving the chicken and sauce over noodles or mashed potatoes! 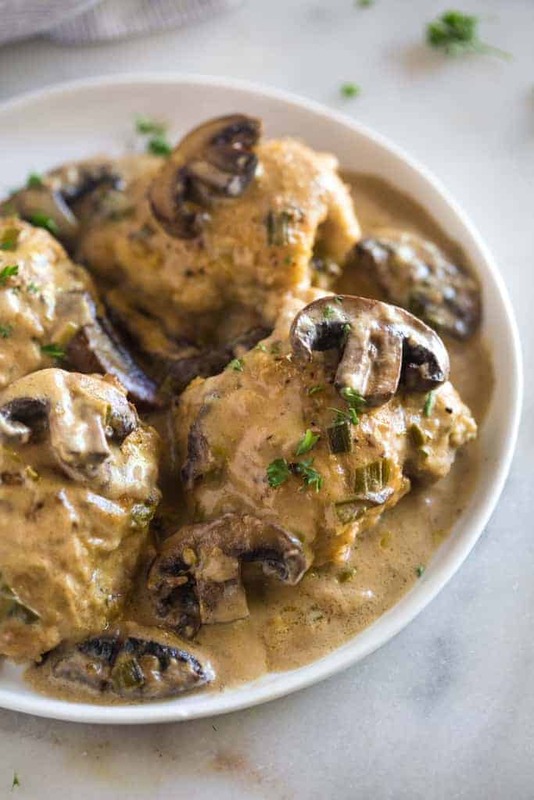 This chicken marsala sauce is made up of chicken broth, onions, garlic, mushrooms, green onions, marsala wine, and heavy cream. You can find real marsala wine in the wine section of the grocery store, or you can buy cooking marsala wine that is usually found in the baking isle. I used the cooking wine because it’s a little less potent and I knew my kids would like it better. But you can use the real deal as well! Marsala wine has a unique flavor, and given that it is the star of this dish, any substitutions won’t taste quite the same. If you’re concerned about adding alcohol to this dish just know that the alcohol gets burned of as it boils, in step 7. Can I use chicken breasts instead of chicken thighs? I HIGHLY recommend using chicken thighs for this recipe because they cook so much better in the instant pot than chicken breasts do. If you must use chicken breasts, you can. Cook time is the same. Can I make this recipe on the stove-top if I don’t have an Instant Pot? YES! Use can use the same method but brown the chicken in a skillet until completely cooked through. Then, remove the chicken to a plate while you make the sauce in the skillet. Add a little oil to the skillet and cook the mushrooms, green onion and garlic for 2 minutes. Add the marsala wine and bring to a boil for 3 minutes. Add the chicken broth and cream and cook for a few more minutes, until thickened. Spoon sauce over chicken, to serve. I just made this tonight — OMGOSH it was soooo good — I made extra so that I could have some for work tomorrow. Except it was so good the kids fought over who got 2nds and needless to say I need to figure out something else for lunch. Even my 9 year old picky eater was fighting for 2nds!!!! Awesome meal — I used chicken breasts instead of thighs, didn’t dredge them, and forgot to buy mushrooms — but hey it was still a hit and really that’s all that matters. The sauce wasn’t as thick as I’d like but still super yummy!!!! I am going to try this tonight….I always make it on the stove….but I have a brand new kitchen and I am obsessive about the stove and keeping it looking like new…I find that is my motivation for using the Instant Pot. I will use boneless/skinless chicken breasts but will probably cut them in half again to make them thigh size….I normally slice the chicken thin for the stove top. Made it tonight. The thighs were tender, and the mushrooms, yum! Next time, I’ll note that it took more oil than stated here, and for us, it needed more salt, oil to cook the chicken, and wine. I’d also add an herb like basil. We had it over quinoa. Thanks for posting this! Chicken is cooked perfectly. Just not a lot of flavor. the chicken was bland the mushrooms were flavorful… the sauce not so much… didn’t make enough sauce. A little tweak you can do if you don’t have cream is to add some cream cheese instead. It makes it so rich and creamy. I add a tablespoon of dijon mustard as well to cut a little of the richness. I use sliced chicken breasts tossed with pasta and all mixed together. I am allergic to dairy and instead of using whipping cream, I used Toffuti vegan cream cheese, and it turned out fantastic! Made this for the second time tonight…. again soooo delicious. I don’t measure really but overdo the liquids a little bit because I throw my pasta into the sauce as it boils at the end to cook it. The starch thickens the sauce and I can’t get enough of it! Loved this recipe. Will be adding it to my favorites on Pinterest. Thank you for sharing.